Service Coordinators are hired for recruiting and training customer service employees and as well to manage the employee schedules, oversee employee interaction process and handle issues. Essential roles and responsibilities listed on successful Service Coordinator Resume are – monitoring service, improving services, matching clients to service, resolving client issues and following-up with clients. 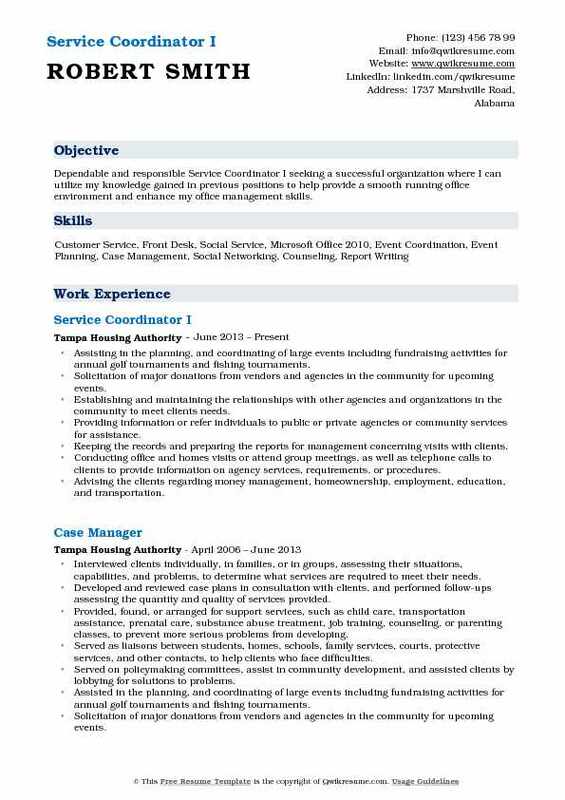 In addition, the Service Coordinator also takes charge of duties such as – managing employee schedules, reporting problems to Managers, devising plans to improve customer service, scheduling meetings, promoting company product and service, assisting in designing promotional materials and working with PR department to handle media appearance. In order to accomplish the daily tasks, the Service Coordinators are expected to possess the following qualifications – result-oriented approach, the ability to pay attention to details, ability to stay calm and work under pressure, record-keeping skills, analytical skills and ability to work under minimal supervision. This job post also requires a good knowledge of MS Office Suite, various type of related software and standard office equipment familiarity. A college degree in Business administration is commonplace among Service Coordinators. 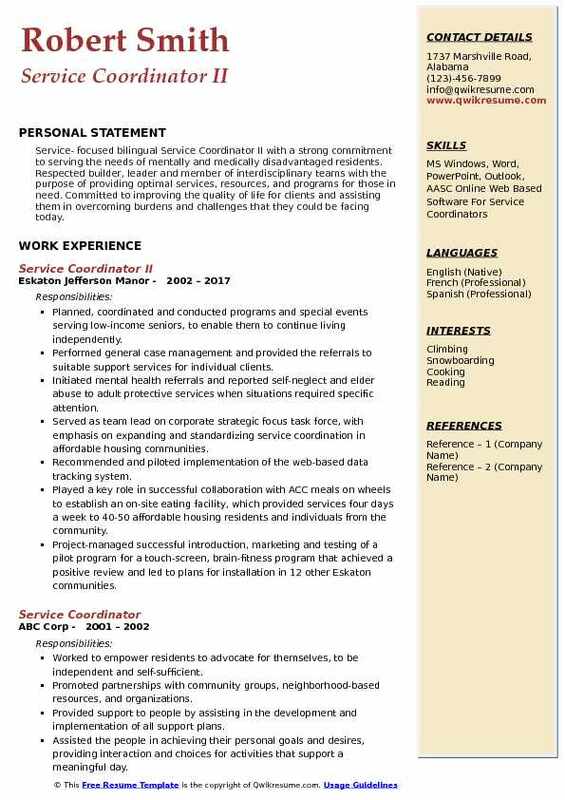 Headline : Energetic, results-oriented Service Coordinator eager to bring strong administrative skills to a growing company in need of top-level support. Excellent organization, communication, and relationship-building skills. Reliable and friendly professional able to work with little oversight and collaborate in team environments. Assisting in developing program policies, guidelines, and expectations to ensure program structure. Planning monthly meetings with all participants and staff to discuss program issues, concerns, as well as any praises or celebrations we had. Developing ideas for training sessions, activities, and educational experiences for our program participants and ensuring they are utilizing them to the best of their ability. Responsible for delegating the daily responsibilities and schedules for staff as well as participants each week. Performing the weekly performance reviews of all participants to report each staff meeting. Responsible for scheduling AA/NA meetings, cornerstone treatment assessments, as well as sponsor support. Responsible for ensuring the participants are meeting the requirements of each phase in order to remain in the program. Responsible for reports each month to validate participant requirements are being met. Documenting case notes, referrals, inputting participant service/enrichment hours into the database. Advocating for the families, for their well-being, needs, and any issues or conflicts. 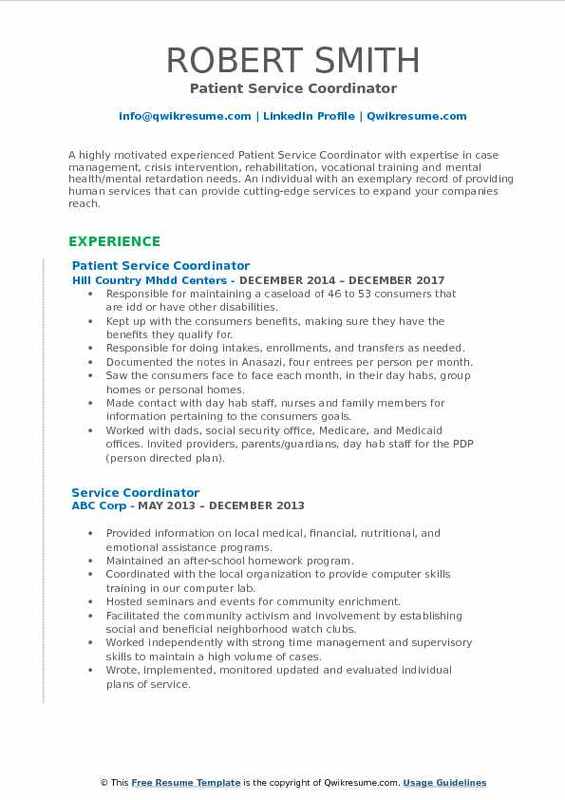 Summary : Possess 11 years of experience as a Service Coordinator III for seniors, working with approximately 180-300 residents on a daily basis. Hands-on management with residents, self-motivated, highly disciplined individual with superb leadership qualities-able to motivate personnel to achieve growth and goals. Excellent oral and written communication, interpersonal, and negotiation skills. Served as the social worker for the supportive living department of the senior housing at Joshua's arms. Ensured elderly residents, especially those who were frail or at risk, were linked to specific supportive services and benefits they needed to continue a high quality of living standard. Performed case management of resident files; assessed each resident to determine the level of needs and matched them to the appropriate agency to provide those services. Scheduled appointments and visited prospective residents at their current place of residence, often able to assess the level of housing needed during these appointments. Collaborated with Medicaid Representatives to ensure required enrollment applications and other documents were complete and accurate for those individuals that qualify for Medicaid. Reviewed documentation to ensure compliance with state and federal guidelines. Directed the workflow with the medical staff to the various residents. 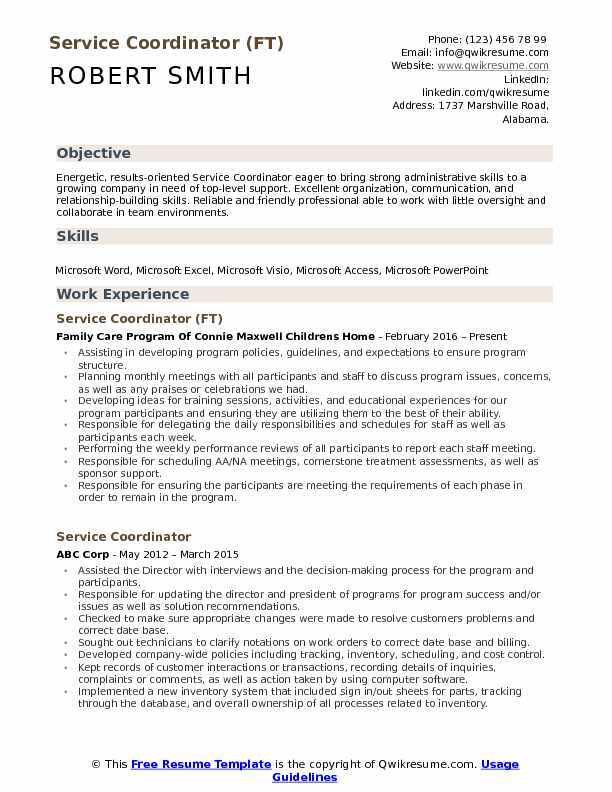 Objective : Junior Service Coordinator wanting to be placed in a job that is secure and room for advancement and the use of my abilities that will be used to benefit the company. Would like my knowledge and ability to motivate and lead people to be put to the test. Serving 15 18-24-year-old youth experiencing homelessness find housing using a housing first model. Aiding the clients in learning life skills necessary for the responsibilities of rent and utilities and maintain the upkeep of a household. Assisting the clients with individual needs (ie childcare, benefits, educational and employment goals, mental health needs, substance abuse-related issues, legal assistance, transportation). Coordinating the moving clients into new apartments and accruing housewares, appliances, and furniture. Supporting the clients with activating new utilities and lease signing. Performing the routine walk-through inspections of clients residences as a part of appeasing the habitability standards. Establishing the working relationships with landlord and property management companies in order to promote star and to ensure fair and equitable housing of vulnerable clients according to hud guidelines. Encouraging the clients to increase income in order to ensure in clients personal success as well as programmatic success. Responsible for accurate progress notes and reporting into Osnium database. 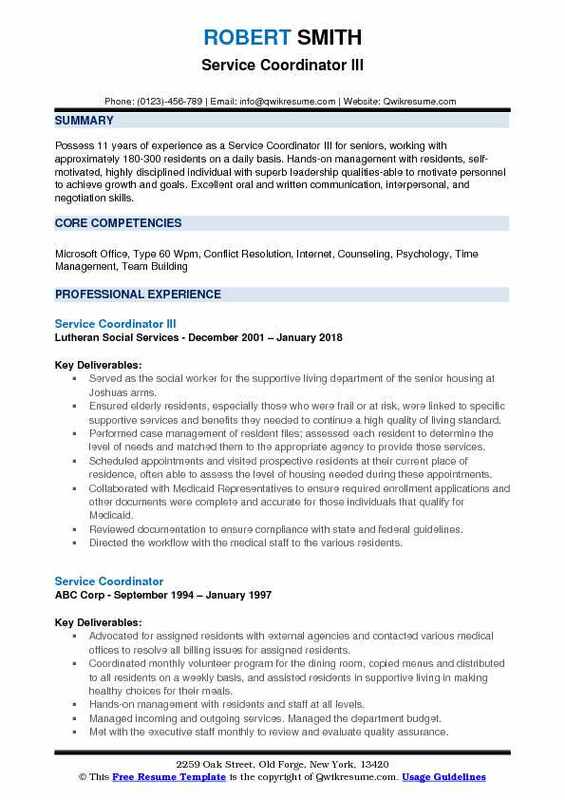 Objective : A highly motivated experienced Patient Service Coordinator with expertise in case management, crisis intervention, rehabilitation, vocational training and mental health/mental retardation needs. An individual with an exemplary record of providing human services that can provide cutting-edge services to expand your companies reach. Responsible for maintaining a caseload of 46 to 53 consumers that are idd or have other disabilities. Kept up with the consumer's benefits, making sure they have the benefits they qualify for. Responsible for doing intakes, enrollments, and transfers as needed. Documented the notes in Anasazi, four entrees per person per month. Saw the consumers face to face each month, in their day habs, group homes or personal homes. Made contact with day hab staff, nurses and family members for information pertaining to the consumer's goals. Worked with dads, social security office, Medicare, and Medicaid offices. Invited providers, parents/guardians, day hab staff for the PDP (person directed plan). Wrote up the PDP with the assistance of the consumer's input on the goals they wanted to work on. Held call team meetings as needed to obey traffic laws and follow established traffic and transportation procedures. 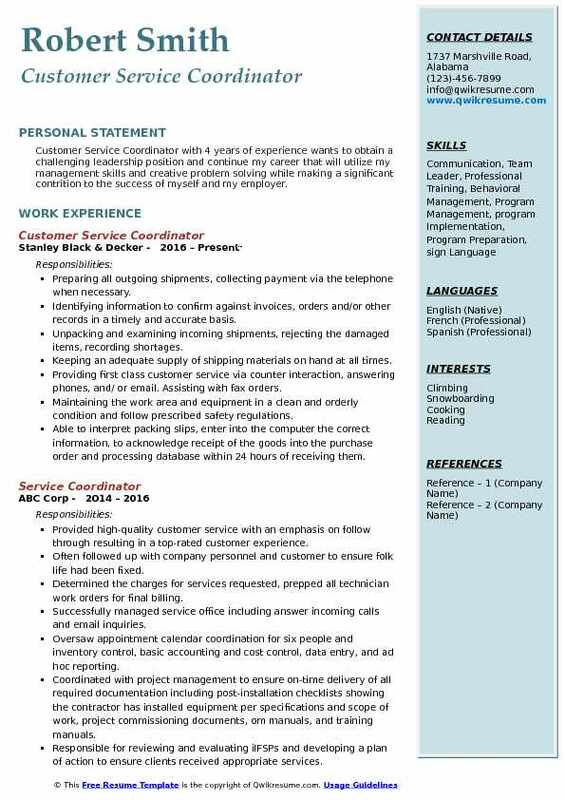 Objective : Customer Service Coordinator with 4 years of experience wants to obtain a challenging leadership position and continue my career that will utilize my management skills and creative problem solving while making a significant contrition to the success of myself and my employer. Preparing all outgoing shipments, collecting payment via the telephone when necessary. Identifying information to confirm against invoices, orders and/or other records in a timely and accurate basis. Unpacking and examining incoming shipments, rejecting the damaged items, recording shortages. Keeping an adequate supply of shipping materials on hand at all times. Providing first class customer service via counter interaction, answering phones, and/ or email. Assisting with fax orders. Maintaining the work area and equipment in a clean and orderly condition and follow prescribed safety regulations. Able to interpret packing slips, enter into the computer the correct information, to acknowledge receipt of the goods into the purchase order and processing database within 24 hours of receiving them. Opening the store which includes having access to the safe, counting money, and recording all cash count. Assisting the Service Center Manager with bank deposits while the Manager is away. Headline : Dependable and responsible Service Coordinator I seeking a successful organization where I can utilize my knowledge gained in previous positions to help provide a smooth running office environment and enhance my office management skills. Assisting in the planning, and coordinating of large events including fundraising activities for annual golf tournaments and fishing tournaments. Solicitation of major donations from vendors and agencies in the community for upcoming events. Establishing and maintaining the relationships with other agencies and organizations in the community to meet clients needs. Providing information or refer individuals to public or private agencies or community services for assistance. Keeping the records and preparing the reports for management concerning visits with clients. Conducting office and homes visits or attend group meetings, as well as telephone calls to clients to provide information on agency services, requirements, or procedures. Advising the clients regarding money management, homeownership, employment, education, and transportation. Resolving issues with clients through proper coaching and mentoring techniques. Serving as liaisons between students, homes, schools, family services, courts, protective services, and other contacts, to help clients who face difficulties. Serving on policymaking committees, assisting in community development, and assisting the clients by lobbying for solutions to problems. 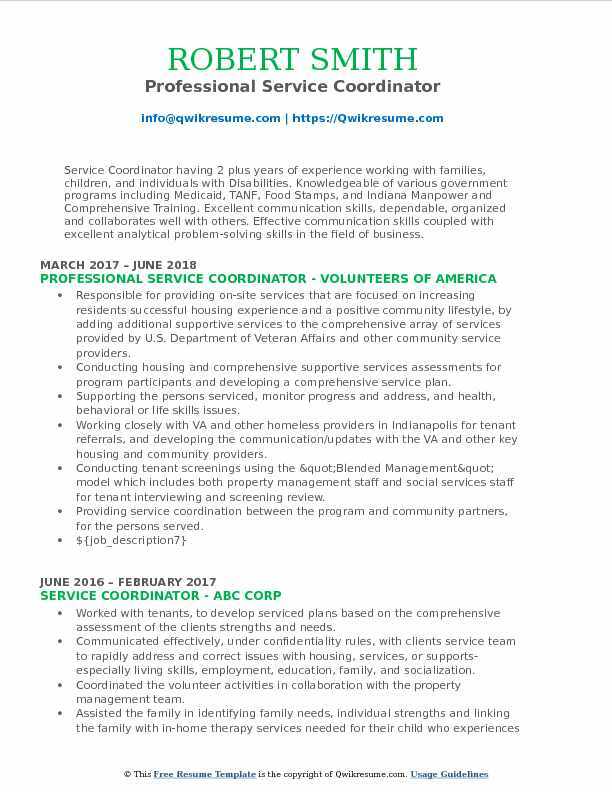 Objective : Service Coordinator having 2 plus years of experience working with families, children, and individuals with Disabilities. Knowledgeable of various government programs including Medicaid, TANF, Food Stamps, and Indiana Manpower and Comprehensive Training. Excellent communication skills, dependable, organized and collaborates well with others. Effective communication skills coupled with excellent analytical problem-solving skills in the field of business. Responsible for providing on-site services that are focused on increasing residents successful housing experience and a positive community lifestyle, by adding additional supportive services to the comprehensive array of services provided by U.S. Department of Veteran Affairs and other community service providers. Conducting housing and comprehensive supportive services assessments for program participants and developing a comprehensive service plan. Supporting the persons serviced, monitor progress and address, and health, behavioral or life skills issues. Working closely with VA and other homeless providers in Indianapolis for tenant referrals, and developing the communication/updates with the VA and other key housing and community providers. Conducting tenant screenings using the "Blended Management" model which includes both property management staff and social services staff for tenant interviewing and screening review. Providing service coordination between the program and community partners, for the persons served. 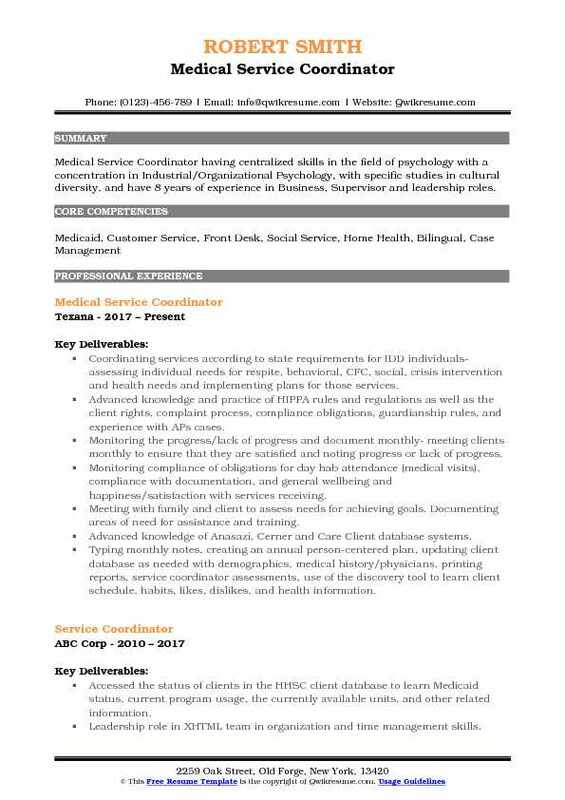 Summary : Medical Service Coordinator having centralized skills in the field of psychology with a concentration in Industrial/Organizational Psychology, with specific studies in cultural diversity, and have 8 years of experience in Business, Supervisor and leadership roles. Coordinating services according to state requirements for IDD individuals- assessing individual needs for respite, behavioral, CFC, social, crisis intervention and health needs and implementing plans for those services. Advanced knowledge and practice of HIPPA rules and regulations as well as the client rights, complaint process, compliance obligations, guardianship rules, and experience with APs cases. Monitoring the progress/lack of progress and document monthly- meeting clients monthly to ensure that they are satisfied and noting progress or lack of progress. Monitoring compliance of obligations for day hab attendance (medical visits), compliance with documentation, and general wellbeing and happiness/satisfaction with services receiving. Meeting with family and client to assess needs for achieving goals. Documenting areas of need for assistance and training. Advanced knowledge of Anasazi, Cerner and Care Client database systems. Typing monthly notes, creating an annual person-centered plan, updating client database as needed with demographics, medical history/physicians, printing reports, service coordinator assessments, use of the discovery tool to learn client schedule, habits, likes, dislikes, and health information. 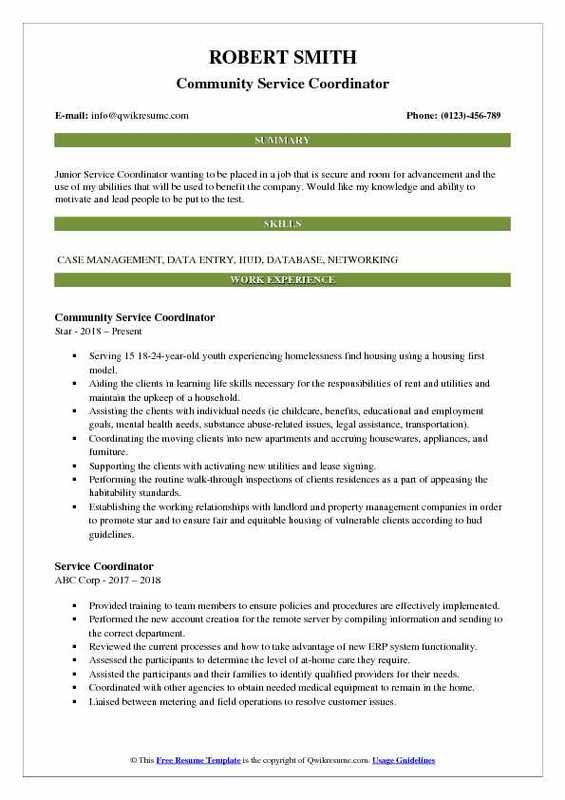 Summary : Service- focused bilingual Service Coordinator II with a strong commitment to serving the needs of mentally and medically disadvantaged residents. Respected builder, leader and member of interdisciplinary teams with the purpose of providing optimal services, resources, and programs for those in need. Committed to improving the quality of life for clients and assisting them in overcoming burdens and challenges that they could be facing today. Planned, coordinated and conducted programs and special events serving low-income seniors, to enable them to continue living independently. Performed general case management and provided the referrals to suitable support services for individual clients. Initiated mental health referrals and reported self-neglect and elder abuse to adult protective services when situations required specific attention. Served as team lead on corporate strategic focus task force, with emphasis on expanding and standardizing service coordination in affordable housing communities. Recommended and piloted implementation of the web-based data tracking system. Played a key role in successful collaboration with ACC meals on wheels to establish an on-site eating facility, which provided services four days a week to 40-50 affordable housing residents and individuals from the community. Project-managed successful introduction, marketing and testing of a pilot program for a touch-screen, brain-fitness program that achieved a positive review and led to plans for installation in 12 other Eskaton communities. 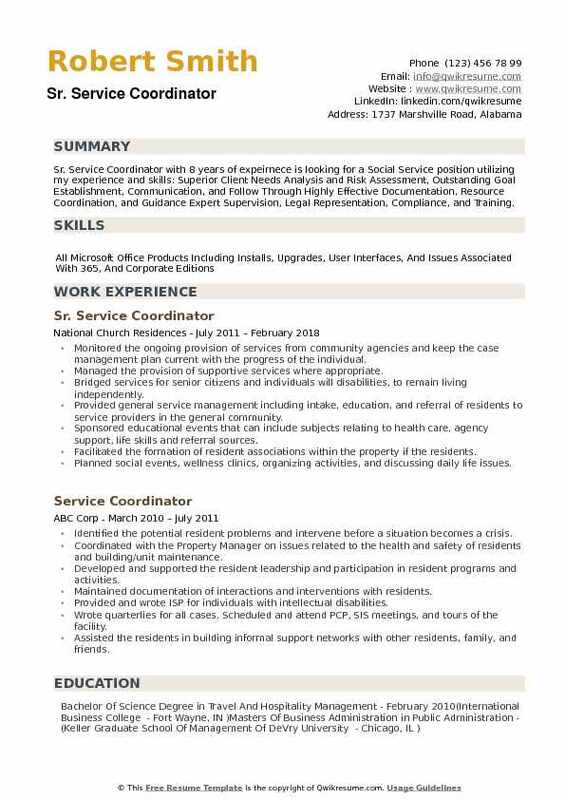 Summary : Sr. Service Coordinator with 8 years of expeirnece is looking for a Social Service position utilizing my experience and skills: Superior Client Needs Analysis and Risk Assessment, Outstanding Goal Establishment, Communication, and Follow Through Highly Effective Documentation, Resource Coordination, and Guidance Expert Supervision, Legal Representation, Compliance, and Training. Monitored the ongoing provision of services from community agencies and keep the case management plan current with the progress of the individual. Managed the provision of supportive services where appropriate. Bridged services for senior citizens and individuals will disabilities, to remain living independently. Provided general service management including intake, education, and referral of residents to service providers in the general community. Sponsored educational events that can include subjects relating to health care, agency support, life skills and referral sources. Facilitated the formation of resident associations within the property if the residents. Planned social events, wellness clinics, organizing activities, and discussing daily life issues. Served as a liaison to community agencies, network with community providers, and seek out new services available to the residents.